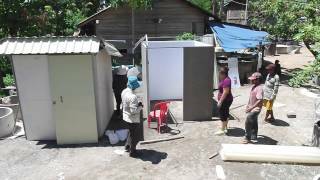 When we began to look at ways to improve hygiene in rural communities across the Mekong, our focus was on the household – how can we motivate families to wash their hands consistently? We designed the HappyTap – a portable sink that was developed with insights from Vietnamese and Cambodian mothers and tested in rural homes with young children. As more homes adopted the unique sink, we wanted to know if it could be used effectively in other contexts to tackle the hygiene crisis. In rural Cambodia, clinics and hospitals are often lacking sinks for both patients and healthcare workers to wash their hands. It’s a scenario that puts communities at risk of health epidemics and the spread of infectious disease. In 2015, we partnered with Emory University to better understand if equipping hospitals with HappyTaps could mitigate the risk. Program Manager, Lindsay Denny, speaks about her observations and findings from the two-year project. Walking through a packed hospital in rural Cambodia, I noticed a problem I had seen countless times before. In a facility caring for more than 100 patients per day, only a few sinks for handwashing were available. Certain areas of the hospital, like the delivery room, had a functional sink. But the building which housed both the pediatric and post-surgery wards had none. Standing between two rows of beds observing the patients and their caregivers, I wondered how the staff could wash their hands without access to a sink. One of the nurses explained they sometimes used hand sanitizer. However, since they often had to purchase it themselves, it was used sparingly. Otherwise, they would walk to the building next door to access a functioning sink and soap. Neither option was ideal nor realistic for ensuring proper hand hygiene among healthcare workers. This scenario is not unique to Cambodia, or the developing world at large. An article published earlier this year found that 50% of healthcare facilities in low- and middle-income countries do not have water piped into the facility1. Water access within wards is an even greater challenge. Soap and water are imperative for handwashing and proper infection control and prevention. Hand sanitizer is useful, but can be cost prohibitive, and in some situations, inappropriate. For example, when the hands are covered in blood or with other bodily fluids, the CDC recommends washing hands with soap and water. What then do you do when there aren’t enough sinks in the hospital? We partnered with WaterSHED to test if the HappyTap portable sink was a possible solution. We were interested in the handwashing device because it is affordable, mobile, and easy-to-use. The team at WaterSHED was curious whether the HappyTap would be an acceptable technology in the healthcare setting. While the hospital staff were keen to try out the HappyTap, they made it clear that they wanted their own designated sinks, separate from patients and caregivers. Four HappyTaps were placed on carts (such as those used to move medical supplies around the wards) in critical handwashing areas lacking water access. In addition, a mirror and poster about handwashing were hung on the wall above the HappyTaps. Staff members were assigned to refill the HappyTap with water. During initial visits, we found the four HappyTaps were not only intact and functional but also in regular use. Staff in wards without sinks reported that they used the HappyTaps more frequently for handwashing than other sinks in the hospital because of the proximity. When we returned after a year and a half, these HappyTaps were still present and fully functioning. Staff proudly presented add-ons to the handwashing station, like a drying towel hanging off a rack on the cart and liquid soap purchased specifically for the HappyTap. Surprisingly, the location of the HappyTaps had not changed. We had placed them on carts with wheels so that the staff could move the sinks around the wards while visiting patients. However, the staff seemed to prefer a fixed location. Overall the staff indicated high satisfaction with the HappyTaps and several inquired about purchasing one for their homes. Access to water within healthcare facilities is a global challenge. To improve adherence to standard handwashing precautions, creative solutions to provide soap and water within the wards are needed. 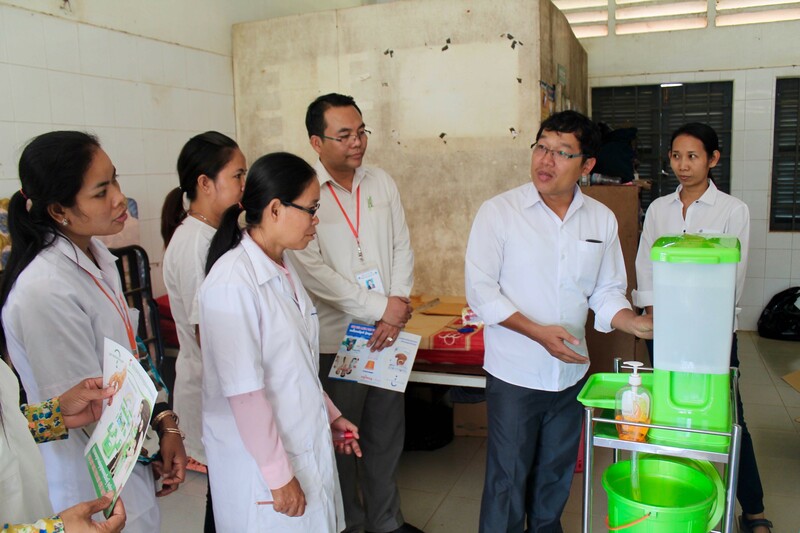 Until hospitals have access to piped water and fixed sinks at critical locations, our experience with the HappyTap in Cambodia demonstrates that portable handwashing stations may be an acceptable technology to fill the gap. Cronk, R. 2018. Environmental conditions in health care facilities in low- and middle-income countries: Coverage and inequalities. International Journal of Hygiene and Environmental Health.